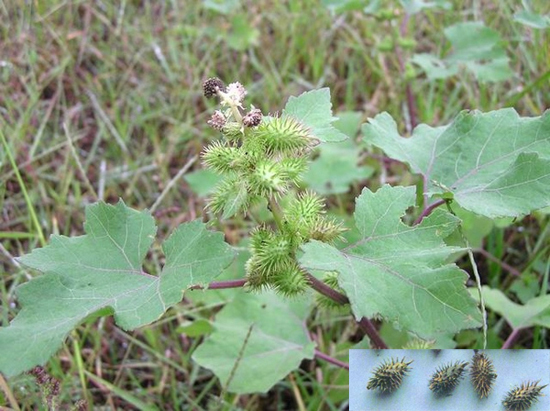 Common Name: Xanthium fruit, Cocklebur fruit, Siberian cockleburr fruit. Part Used & Method for Pharmaceutical Preparations: The fruit is gathered in autumn, dried in the sun and then baked till the thorns fall off. Properties & Taste: Pungent, bitter, warm and slightly toxic. Functions: 1. To open the nasal cavities; 2. To dispel wind and dampness; 3. To stop pain. 1. Rhinorrhea manifested as headache, nasal obstruction, runny nose and loss of smell. Xanthium fruit (Cang'erzi) is used with Magnolia flower (Xinyi) and Dahurian angelica root (Baizhi) in the formula Cang'er San. 2. Wind-damp bi syndrome manifested as joint pain and spasms of the limbs. Xanthium fruit (Cang'erzi) is used with Clematis root (Weilingxian), Cinnamon bark (Rougui), Atractylodes rhizome (Cangzhu) and Chuanxiong rhizome (Chuanxiong). 3. For hives with itching. Dosage: 3-10 g, decocted in water, or in pill or powder form for internal use. Cautions & Contraindications: This herb is contraindicated in headache due to blood deficiency. Large doses may result in symptoms of toxicity, including abdominal pain, vomiting, and diarrhea.